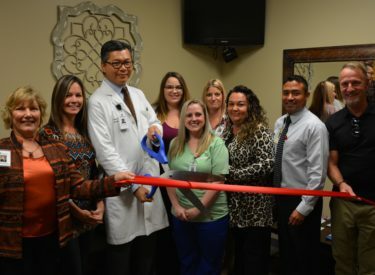 The Chamber held a Ribbon Cutting Ceremony for Dr. Gery Hsu located in the Medical Building on the AllianceHealth Ponca City Hospital campus. Dr. Hsu is a neurosurgeon. Holding the ribbon are Marta Sullivan and Kevin Kreger. From left are Mindy Meyer, Dr. Gery Hsu, Ternee Edmisten, Holli Smith, Kristine Clinton, Melissa Cecena and Chris Mendoza.